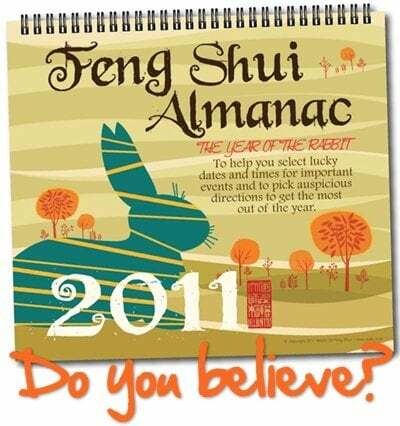 Home » Interesting Discussions » Your Say: Do you believe in Feng Shui or the Chinese Almanac? Your Say: Do you believe in Feng Shui or the Chinese Almanac? Today is the 6th day of Chinese New Year and the first day of work for me. I also realised after talking to quite a few people, that today is also the first day they are opening their offices for business. The reason, as many told me was because “The 6th day is a good day for starting business”. And I believe it! 😀 Do you? Yep! I do believe in good or not so good days for significant events, like the commencement of business but not to the extent of going out of my way to do anything silly or to plan my life around these dates. The Chinese Almanac is usually calculated according to one’s Chinese year of birth which determines your Chinese zodiac. It is supposed to be even more accurate if time of birth was taken into consideration, but I usually stop at the year. So yes. In this modern day and age, when most would scoff at such backward thinking methods, I will confess to believing and sometimes putting into practice feng shui elements and following the good and not so good days for major events, as foretold by the Chinese Almanac. PREVIOUS POST: Clarins Rouge Prodige Paradise Pink : Is it almost paradise? I believe! 🙂 As you mentioned, it also doesn’t hurt to believe. In any case, I think that we can opt to take any help we can necessary. Gong Hei Fatt Choy! Yes, i feel that fengshui might work for some. But i believe even more that we can change our destiny by what we do, think and say after reading and watching the drama “Liao Fan’s Four Lessons”. Destiny is in our own hands and we do reap what we sow. Yup! Btw, even big corporations like coca cola apply feng shui these days. Haha yep! Whatever doesn’t bother or hurt me I’d happily believe. Went through the whole buying stuff thing many years ago, realised it was only enriching those who advice you to buy and so bleh! I’ll do it myself with a bit o’luck 😉 Gong Xi Fa Cai! i don’t believe. if it’s so simple as placing or removing an item, you’ll be blessed then there’ll be no hardship, no poor and everything is hunky dory! but at the end of the day, if you feel comfortable and believing it gives you peace of mind, then go for it. i’ve seen some horrors of house reno using feng shui principles…totally crazy. I study feng shui and astrology as well as give consultations on it, so yes, I do believe it 😛 Though also not to the extent of deliberately going out of my way to have a “good” day and such. I study under Joey Yap’s branch, so there’s no emphasis on the placement of items, unlike another practitioner lol! And instead he always emphasises on the self- the self and one’s personality plays a very big part. You may have a very good Bazi chart (Heaven luck) and very good feng shui (Earth luck), but if you don’t work for it yourself too (Man luck), all that good stuff can’t help you much. How awesome that you’re studying it! I do prefer the Joey Yap style of feng shui. There’s only so much help you can get from divine intervention and if we don’t do anything with our own effort it all comes to nothing. That is very true- it all depends on one self and one’s personality. Nothing comes for free, after all haha! 😛 My family went through the whole placement and buying things branch, and after a while when we saw how the same cures are just “improved” and modified year after year (When the old ones can be used for the same thing), it seems so bleh. Part of me thinks it’s all wish wash especially in the light of the discovery of a “new planet” affecting western astrology. But just like the rest, the other part of me thinks “no harm in it” except of course, I would not part with hard earned money to purchase the little trinkets. I have many of those given to me by friends and I do try to place them in appropriate places or carry the charms around. I think it’s all related to the psychology and if carrying a little good luck charm can give you that extra little boost in feeling good, then why not? When you feel good, you tend to have a more positive outlook on things and when you are positive, things fall into place much more easily IMO. Also, the charms represent the care that my friends have for me in buying those pieces for me and that means a lot more to me than the actual story behind the charms. Aww that’s sweet of your friends to give you good luck charms! That is in itself a whole lot of luck already 🙂 And yeah knowing you might be carrying a good luck charm might have something to do with our confidence. Also, that whole new planet and new western zodiac thing threw me for a loop! Yes! A lot of feng shui is to do with common sense. I believe the origins of it is to do with bringing harmony between oneself and one’s surroundings. 🙂 If it feels good, that’s good feng shui! oh yes I believe~! started with dad’s bout of “bad luck” years ago until mom intervene and used feng shui (change furniture settings, put chrystals in certain parts of the house – moon the chrystal to “purify”), his luck changed~! but dad still don’t really believe it though. Lol!! I know exactly what you mean! Do everything in moderation I say, or risk looking like Shrek! 😉 Glad to know things are better with your dad – perhaps the crystals helped to push his luck in the right direction… Who knows? Well, I don’t wash my hair or sweep the floor on the 1st day of Chinese New Year, but it’s just one of those things that’s fun to follow as long as it doesn’t inconvenience you that much. Hmmm, since I’m Brazilian of Japanese origin, I’m not really sure what is the Chinese Almanac – is it similar to the horoscope? I only know that my Chinese zodiac sign is dog. So many cool animals and I get the dog… +_+ Then again I’m not a believer. Any way or the other, I like going to houses that follow Feng Shui – they are much more minimalist and have an overall clean design. So much different from my cluttered home! Actually, my grandparents were Japanese – on both sides – and came to try a living here in Brazil. So I’m Brazilian, but there was no mix in the pot. When the Japanese came here they lived pretty much apart from the rest of society and would rather marry among themselves: you know, same values, same culture, all struggling to make it here. Of course things are no longer as they were, Brazil is a true melting pot of all races and the majority is “mestiço” (mixed), as we call them. But I think the Asian people tend to hold onto their original cultures more than the others – I’m not sure why, though.^^ Maybe because Brazil hasn’t got a background of its own. Yeah, they usually follow it pretty loosely, with just a few mirrors here, some water there… I’ve never been to a Feng Shui fanatic house yet! 😀 How can things get that odd? Yes, I believe in Feng Shui. But of course, in moderation and whatever is practical.